This manuscript is a compendium of well over a hundred different texts, most of which were composed earlier than the 12th century. 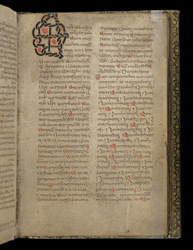 The style of its handwriting has been recognised as that of Uilliam Mac an Lega, one of the most prolific scribes of the second half of the 15th century, and it has additions by his son, which suggests that it was written for Uilliam's own use, and remained in his family for a period. Later owners include the Fitzgeralds, Earls of Desmond, and it remained in Ireland until the 19th century.